YOUNG local entrepreneurs will be given a chance to start their own business at a unique ideation camp on Tuesday 1 October in Ballynahinch (Millbrook Lodge Hotel). The ideation camp is part of a Bright Idea programme which is being funded by Down district Council and five partner councils in the south east economic development region (SEED). 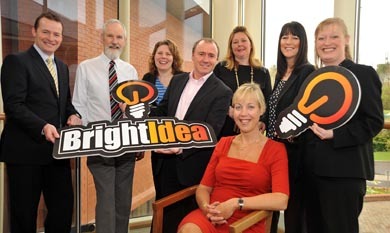 The Bright Idea youth entrepreneurship programme is an innovative business start up programme for young people in the Ards, Armagh, Banbridge, Craigavon, Down and Newry and Mourne areas. It will assist local young entrepreneurs with the pre-start and start-up phases of their business ideas to positively impact on the local economy by becoming business owners. The SEED business ideation programme is launched to attracted young entrepreneurs to set up new businesses. The programme will encourage innovation and entrepreneurship and motivate potential business owners in the 18 to 29 age group, to think and act positively to get their business idea off the ground. As part of this programme Ideation Camps are being held to help participants experience and develop skills that can increase the relevance, scale and impact of their business ideas. The camp will follow the thought process which successful ideators, innovators and entrepreneurs have used around the world. Councillor Gareth Sharvin, Vice-Chairman of Down District Council said: “The Bright Idea programme gives young people aged 18-29 years a fantastic opportunity to become young entrepreneurs and will help to equip young people with the skills to improve their business idea. The programme involves ideation camps, which are designed to bring participants through a process of idea generation.